Whoa...where to start. After my original post, Mystery Couple Seen at Cumberland Falls, I got a great response in the form of emails and messages. Much of the information was very interesting and possibly sheds some light on the mystery couple photograph. In this follow up post I will share most of the information that was sent to me and offer up some other interesting tidbits. Are you ready? Here we go! So, our main objective was to try and find out more information about the mystery couple. We really wanted to know if it was just real people visiting the Cumberland Falls that weekend or have they been seen at other times. Well, we got some answers about that. "I grew up in Grays Kentucky, not far from Corbin. when I was growing up it was common to see the Ghost Couple. They are seen all over the park especially at the cabins. They never get really close enough to get very good pictures. There are so many stories about how they died, there’s a bridge above the falls that you will see them at quite a bit, but as you get closer they disappear. My brother is a Wildlife Conservation Officer in that area, and he also see’s them a lot but still can’t get very good pictures. We just call them Maw and Paw. " So, with that one message it appears we are dealing with a reoccurring phenomenon that is witnessed often. But wait that is not all. "I was there the same day Jasmine was. I seen the same thing. In the legend about the couple, it states that the bride jumped into the falls and died when the groom left her at the alter. I grew up in Williamsburg, Ky and Corbin Ky and we go to the falls quite regularly. These people, they're not people, they're ghosts. I have seen them several times, in the same clothes, since I was a kid... Her pics are solid, they're the best ones I've seen if the couple yet. Thanks for your time. I will also talk a little more about the Bride and Groom story in a little bit, but lets continue with the mystery couple for now. "Hello my name is Ashley . This young lady is not the first person to see these people. It is in fact a married couple...my dad told me once of the same couple, there is tale of a old mining community that use to be in that area. The couple had found the falls hiking when a storm blew in and flooded the area killing the couple. I have also noticed some stuff in the picture that interested me if you zoom on in on there faces you will see they have none. The lady is also not wearing shoes... the lady also has a baby in her arms and the man has a gun in his hand. This couple is known for standing up in the tree line were the top trail goes. The man is often known for being alone. I have seen the women before on the first trail past the first flight of stairs. I was always told I was a high energy for ghost....maybe a paranormal investigation needs to be done in the are that would help more to know who they are.... or even what other ghost are there." Now, I like the idea of doing a paranormal investigation there, maybe that is something our team can do in the future. 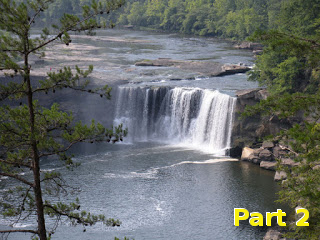 Here is a little more information about the history of Cumberland Falls as provided by Tasha. Well, there used to be a Hotel sitting right on the edge of the Cumberland Falls. It was called the Moonbow Inn but there is a chance it was once named Cumberland Hotel is my guess. I would think this would be rather dangerous for visitors, but that may be why it is not longer there. I'm thinking that the Moonbow Inn actually burnt down, if my memory is correct. I need to do more research on the hotel. This picture, from my understanding, is from the early 1900's. Somewhere around 1925-1930 I do believe. Now, another message/email that talks about this mystery couple and the Bride and Groom story. "My grandmother use to tell me scary stories. One of them being a ghost tale about the Cumberland falls lovely couple ghost tale. There are multiple she use to tell me. Two of them being that a lovely couple was traveling on the trails around a couple 100 years ago but got lost in the mountains. They never found their way out or to their destination. The second one being a lovely couple on their wedding night got in a major argument and the man got aggressive and pushed the woman off one of the rocks but he regretted it right after and took his own life. Now my grandmother has passed away and I was in elementary school when she would tell me this but every time I go or drive there I get this sick feeling and headaches. ...."
Some people also noticed where the mystery couple were standing. It would seem difficult to reach that point without getting wet. "...If I'm not mistaken about that rock, it would be extremely difficult to get on that rock without getting wet... her shirt.. his pants.. their shoes." Sent in from Heather. Now, I think we have basically established that this mystery couple has been seen at various times over the years. This is not unheard of when it comes to spirits, aka Ghost. Ghost are just people without a physical body as we know it. If you look at it in these terms it might be easier to understand. And like us, they often return to places that they liked or made them happy. Then again a spirit may linger in an area because of a tragedy, or what they see as a wrongful death. There are many scenarios and factors as to why spirits hang around in certain areas. Now, lets talk a little about the Bride and Groom story. If you are like me you have probably heard several different version of the story. There is a good reason for that and that is because there are a few different wedding related events that happened at Cumberland Falls. Here is some information provided by Ashlee. 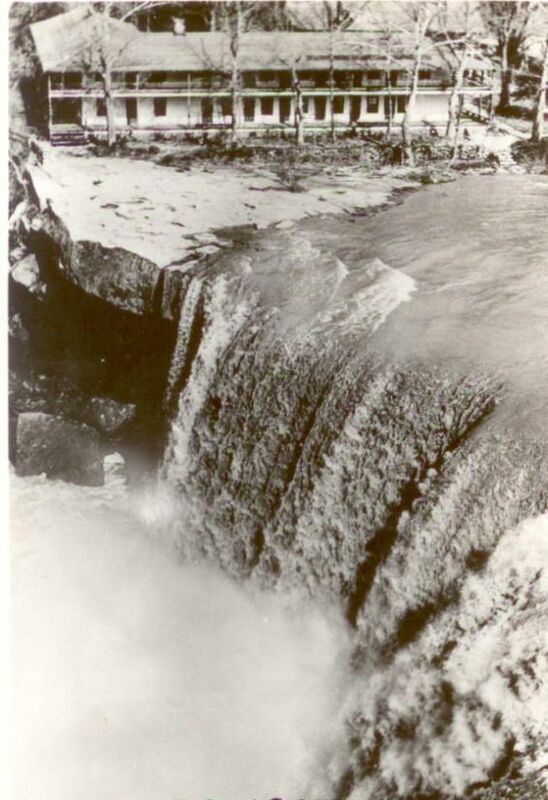 "The Story of the Bride Ghost (according to the Rangers when I worked there in 2007 at the gift shop), goes something like this: In the early 1900’s, there was supposed to be a wedding taking place at the Cumberland Falls. The bride was ready and waiting on her groom, the groom was killed on his was to be Falls in a car accident. The bride was so distraught that she jumped from an area around the Falls (now called “Lover’s Leap”) and died. They never found her body. Supposedly, she and her groom still roam the Falls area in search of each other. You can see her mainly on foggy nights, walking in or close to the road and she will appear before you then vanish. She is crying when you see her. One of the rangers swore up and down her saw her one night, she appeared around the horseshoe curve right before the Falls, he stated his car stalled, then out of no where a fog surrounded the front of the car and woman appeared before him in a 1910-20’s wedding gown weeping. He attempted to get out of the car and then she vanished." During my conversation with Ashlee we talked about the different versions of the Bride story. It turns out there are 3 different bride and groom events that took place over the years. These three events resulted in six deaths. The first supposedly took place somewhere around 1880's. I think the last bride and groom event took place in the 1950s. Many times, at lest one of these ghost brides, is referred to as the Lady in White. But there is also a Lady in Black story, which I know very little about, but I did get this email message about it. "There has been a ghost lady seen in OUR area wearing a long black dress that buttoned under chin. It was by the creek where the undertaker was in the frontier days. Many things are kept secret here.."
Yes, I do think many things are kept on the down low at tourist areas. I guess the thought is that it might hurt tourism. My thought is that it would probably help tourism. That people have a craving for mystery and the unexplained. That the search for answers and the unraveling of a mystery is a driving force and an attractive idea for a lot of people. I know it is for me. 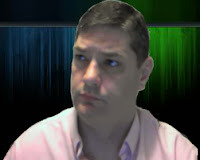 In closing, I would like to thank everyone who took the time to sent in a message or comment. A thank you to those who read and shared the original post. I hope you will also share this post. I still would very much appreciate any more additional information, photographs or stories you'd like to share with me, feel free to send it in. I do have something that was sent in that I hope to share in the future that is yet another mystery. But I feel it deserves its own post, so be on the look out for it.